This looks deliciously hearty – a perfect winter supper. Hi Kathryn – it’s really great at this time of the year. I’ve been making large batches and it’s great for lunch the next day. All those spices give it a real flavour punch. I love this combination. For a couple of variations try Delia Smith’s warm lentil salad with walnuts and goat’s cheese, or Yottam Ottolenghi’s Ottolenghi’s Lentils With Grilled Aubergine (doesn’t have cheese in the recipe, but I like to add some crumbled feta or goat’s cheese). One thing I’d suggest is a splash of vinegar (balsamic’s good but any really would do). 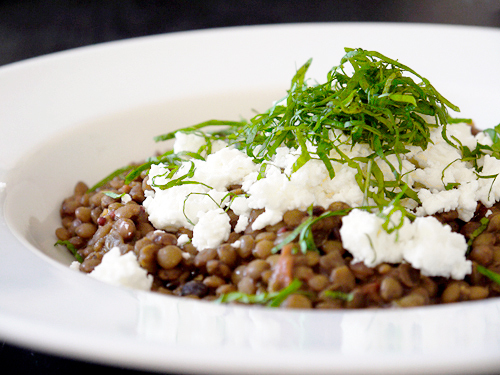 It does something magical to lentils, cuts some of the earthiness and brings them alive. Add towards the end or just after cooking to taste. ﻿﻿Hi Kirsten – it’s a classic flavour combination, isn’t it? Thanks for the tips – the idea of adding walnuts sounds good (lightly toasted I hope), as does the suggestion to add balsamic – in fact, I already add a dash of the stuff when I make beetroot risotto (to balance the earthy flavour of the root), so it must be something similar here. I’ve also got Ottolenghi’s cookbooks, so I’ll dig out the aubergine recipe – his grilled aubergine salad with tahini is superb.